hello, october! the season of ghosts and ghouls is upon us! here's a small confession-i'm not a fan of horror or halloween. it ranks as one of my least favorite holidays. i may have felt a little relief when my kids outgrew the need for costumes and what not. all of my favorite booktubers have started posting their TBRs for the month and i'm finding there are so many great challenges on booktube for october! but, i wanted something that would encourage me to read, especially now that fall tv has occupied lots of my time! so, i decided to create my own challenge for the month! 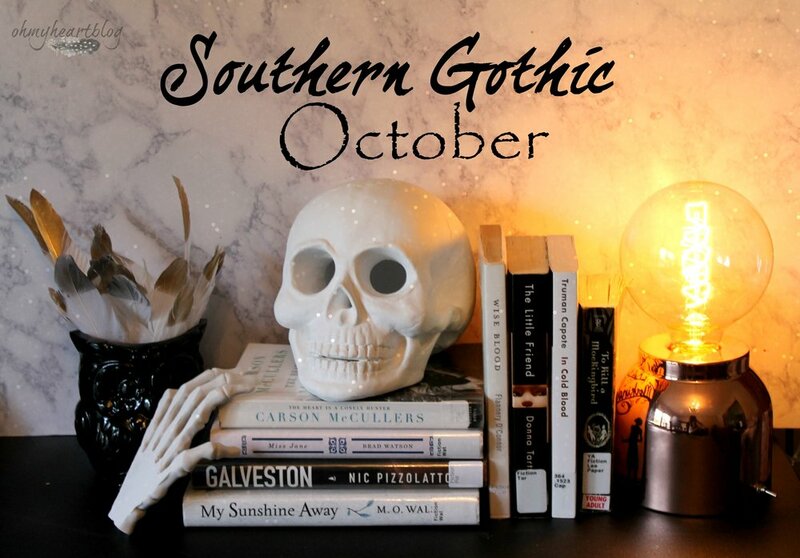 i'm declaring this month southern gothic october or #SoGothtober. i've always loved books about the south and southern culture and this seemed perfect! southern gothic literature often has supernatural, magical or mystical elements. authors use these elements to shine light on or explore social issues. decay and the grotesque provide a vehicle for writers to reveal the unpleasantness that lies in the underbelly of southern gentility. this challenge is also giving me the opportunity reread some favorites and to read for the first time some of the genre defining classics. here's what i'm reading this month!